I was born on January 13th, 1893, in Long Valley, California, of English and Yankee parentage. Most of my formal education was received at the little red schoolhouse of the precinct. As a schoolboy, I believe that I was distinguished more for devilment than scholarship. Much of my childhood was spent in the neighborhood of an alleged gold mine; which may be reason why the romance of California gold mining failed to get under my skin. My first literary efforts, at the age of 11, took the form of fairy tales and imitations of the Arabian Nights. Later, I wrote long adventure novels dealing with Oriental life, and much mediocre verse. At 17, I sold several tales to The Black Cat, a magazine which specialized in yarns of the unusual. Then, for some reason, I lost interest in fiction-writing and confined my efforts to poetry for more than a decade. A volume of verse, The Star-Treader and Other Poems, appeared at the end of my 19th year. A little later, my health broke down, and for ten years my literary production was more or less limited and intermittent. My best poetry, however, was written during this period. A small volume, Odes and Sonnets, was brought out by the Book Club of California in 1918. In 1922 I published Ebony and Crystal; in 1925, Sandalwood. At the beginning of the Depression in 1929, I resumed fiction- writing and have since turned out more than a hundred short stories and novelettes, nearly all of which can be classed as weird or science fiction. Most of these tales have somehow gotten themselves into print. Six tales, The Double Shadow and Other Fantasies, which I printed at my own expense, are among the best. Of the tales published in science fiction magazines, The Eternal World and The City of the Singing Flame, are in my opinion, the most outstanding. Apart from writing, I have made hundreds of fantastic paintings and drawings; also, more than a hundred small sculptures and carvings of imaginative type. I find the making of these far easier and more pleasurable than writing. My poems have appeared in 30 or more magazines, in 10 or 12 anthologies; and some have even been used in school readers. I have done a number of translations from French poetry, amid have dabbled, rather ineptly no doubt, in the writing of French verse. Aside from the aforementioned arts and avocations, I have done, at times, much hard manual labor, such as wood- cutting and fruit picking. I have learned to cook, after a fashion, and have made many kinds of wine. De los jóvenes escritores norteamericanos, nadie pulsa la nota de horror cósmico mejor que el poeta, pintor y cuentista californiano Clark Ashton Smith, cuyos bizarros dibujos, pinturas y cuentos son una delicia para la minoría sensible. El señor Smith utiliza el trasfondo de un universo de espanto, remoto y paralizante -junglas de flores ponzoñosas e iridiscentes en las lunas de Saturno, templos grotescos y malignos de la Atlántida y Lemuria, olvidados mundos primigenios, y pestíferos pantanos de hongos venenosos en regiones espectrales más allá de los confines del mundo. Ningún escritor vivo o muerto ha superado, quizá, a Clark Ashton Smith en la pura extrañeza cósmica y fertilidad de sus creaciones. ¿Quién otro ha podido ver esas espléndidas, exhuberantes y febriles visiones distorsionadas de esferas infinitas y múltiples dimensiones, y ha vivido para contar el cuento? Sus relatos tratan de otras galaxias, mundos y dimensiones, al igual que con extrañas regiones y épocas de la Tierra. Nos habla de la primigenia Hiperbórea y de su amorfo dios Tsathoggua; del continente perdido de Zothique, y de la fabulosa tierra de Averoigne en la Francia medieval, acosada por vampiros. El horror sobrenatural en la literatura. I am profoundly saddened by the news of H. P. Lovecraft's death after a month of painful illness. The loss seems an intolerable one, and I am sure that it will be felt deeply and permanently by the whole weird fiction public. Most of all will it be felt by the myriad friends who knew Lovecraft through face-to-face meeting or correspondence: for in his case the highest literary genius was allied to the most brilliant and most endearing personal qualities. I—alas!—never met him, but we had corresponded for about seventeen years, and I felt that I knew him better than most people with whom I was thrown in daily intimacy. The first manuscript of his that I read (probably in 1920) confirmed me in the opinion of his genius from which I have never swerved at any time. It opened a new world of awesome speculation and eery surmise, a new imaginative dimension. Since then, he has written scores of masterpieces that extend the borders of human fantasy and conquer fresh empires amid the extra-human and ultra-terrestrial infinities. Among these, I might mention The Outsider, The Call of Cthulhu, The Color Out of Space, The Rats in the Walls, The Dunwich Horror, Pickman's Model and The Dreams in the Witch-House as being special favourites. however, there are few tales of his that I have not read and re-rend manny times, always with that peculiar delight given by the savor of some uniquely potent distillation of dreams and fantasy. Leng and Lomar and witch-ridden Arkham and sea-cursed Innsmouth are part of my mental geography; and dreadful, cyclopean R'lyeh slumbers somewhere in time depths. Others will venture into the realms that the Silver Key of his mastery has unlocked; but none will read them with the same wizard surety, or bring back for our delectation essences of equal dread and beauty and horror. Tsathoggua y el Libro de Eibon son creaciones de Clark Ashton Smith. As to the Cthulhu Mythos, I believe I added as much to it as I borrowed. Tsathoggua and the Book of Eibon were my own inventions, and were promptly utilized by Lovecraft. In turn, I borrowed the Necronomicon, which, in its original Arabic, was featured in my yarn The Return of the Sorcerer. Also, I used a quotation from the Necronomicon for a heading on another tale, The Nameless Offspring. Tsathoggua made his debut in The Tale of Satampra Zeiros, and also played some part in The Door to Saturn and The Seven Geases. The Coming of the White Worm was supposedly a chapter from the Book of Eibon; and the book was also featured in Ubbo-Sathla and in The Holiness of Azederac (which latter story mentioned two Lovecraftian deities under the slightly altered names of Iog-Sotot and Kthulhut). Eibon himself entered prominently into The Door to Saturn. All of these underlined (italicized) titles, then, can be considered as having more or less relationship to the Cthulhu Mythos. 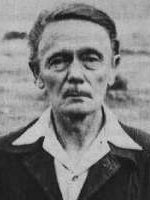 Clark Ashton Smith, 21 de julio de 1953. Aquí se puede encontrar una excelente lista de las obras de los Mitos de Smith. Ni idea, yo me he pillado el último que quedaba. Hiperbórea tiene algo que ver con Zothique, ¿no? Porque uno de los relatos es "The Abominations of Yondo", y Yondo aparece en el mapa de Zothique . Pues lamento no poder ayudar. Sé que forma parte de los mundos perdidos de CAS. Yo creía que Hyperborea era nuestro mundo en un pasado remoto, por lo de Eibon y tal. Hiperbórea tiene algo que ver con Zothique, ¿no? Porque uno de los relatos es "The Abominations of Yondo", y Yondo aparece en el mapa de Zothique . Pues resulta que la edición de Hiperbórea que acaba de sacar Valdemar no trae ese relato, así que no sé qué pensar. Seguramente que no pertenece al ciclo de Hiperbórea, pero entonces, ¿por qué no lo han incluido en Zothique? ¿Hiperbórea es de los Mitos? Hay un par de títulos que suenan cthulhoideos: Error en tag [LINK]: URL externa..
El podcast Noviembre Nocturno, que ya hemos mencionado alguna que otra vez, tiene una excelente adaptación del relato El que camina sobre el polvo; os recomiendo que le echéis un tímpano. Por cierto, ¿hay algún volumen que recoja las aportaciones de Smith a los Mitos? Sé que Valdemar tiene Zothique e Hiperbórea, pero no tengo claro si hay algo más. Ashton Smith tiene cuatro cositas contadas de los mitos. Lo bueno es que tiene su propia personalidad y no hace falta que sea de los mitos para disfrutar de su lectura. Recomiendo cualquiera de los libros ya mencionados. Precisamente ahora estoy leyendo el de Hiperbórea y la verdad es que está muy bien. Gracias a los dos; hace un tiempo empecé con Zothique, pero por algún motivo nunca lo terminé. Puede ser un buen momento para retomarlo, o tal vez para empezar con el Hiboria que menta Gorgo. A ver qué decido.